With the third post in our series on getting the most out of your mattress, you’ll see why we, as well as the good doctor, say there should be no more monkeys jumping on the bed. A Bed. Not a Trampoline. Mattresses are designed to be durable, with their only job being the task of comfortably supporting our bodies for hours a day, year after year. No biggie, right? The engineering that goes into creating a product that can do that however, is much different than what goes into creating impact-absorbing, bouncy play materials for us to jump and horse around on. But with the type of materials used in mattresses, many of us assume that they’ll always be able to handle whatever we serve up. In reality though, using a mattress for anything other than its intended use can quickly and permanently damage it. That means no falling into bed, no eating, drinking or sitting on it like a couch and especially not letting children jump and play on it, if only for their own safety. 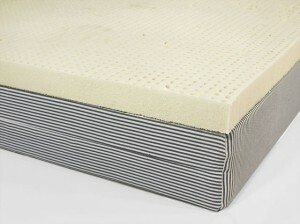 Using a mattress the way it was intended to be used is the easiest way to ensure the quality and longevity of your bed. One way people wear down mattresses prematurely is by using them the same way, every day. That of course, brings up the question, isn’t that exactly what sleeping on it every night does? The answer to that is yes, but that isn’t what causes damage, since that kind of use is exactly what it was designed for. But using a mattress as a couch for watching TV, a chair for reading, or a bench to sit on while getting dressed in the morning is not something a mattress should have to handle. As an example, look at the sole of your shoe. If we all had perfectly flat feet and uniformly flat steps with even impact and weight distribution, every part of our shoe would wear evenly at the same pace. Instead, we all have our own unique gait, with different parts of our feet touching the ground at different times and in different ways. Provided you didn’t buy them yesterday, a glance at the bottom of your shoes will show wear in different areas. Treating your bed as anything other than a bed can do the same thing to a mattress. It may not seem like a big deal, sitting on the edge of the bed every day to put on socks or tie your shoes, especially if it’s only for a few seconds. But when you consider the direct pressure of your body in the same spot every day as well as the forces of sitting down and getting up, the stress on a mattress is more easily understood. Mattresses are made to support weight, but only when it’s spread out evenly by your body as you sleep. The abuse of using it like a seat can quickly wear down a single area of a pressure-relief mattress, leaving lumps, sagginess and a lack of support. Eating and drinking on it is even worse, as crumbs and spills can quickly compromise the mattress, for the reasons listed in Tip #1. A television in the bedroom may be damaging your mattress as well. If you recline while watching, with a gentle boost under your upper body, you’re closely simulating the full recline with which we sleep. This distributes weight fairly evenly and lets your mattress work the way it should. But if you sit on the edge like a chair or sit cross-legged in the middle, you’re targeting your mass on an area too small for your mattress to consistently support without eventually beginning to fail. This type of use can wear down a mattress and create a soft spot or a valley. It may be comfortable to sit in, but with the real reason you own a mattress being the need for a comfortable place to sleep, it’s hardly worth it. Most obviously, treating your bed like a playground or allowing your children to do so is one of the fastest ways to damage your mattress. Rough-housing, running and jumping on the mattress, even just once, can break springs, puncture waterbeds or tear a foam mattress. And with most beds being a foot or two off the floor, the chance of a child falling and getting injured is obviously the best reason to keep a mattress off-limits for play. This is truly the simplest of our five suggestions to abide by, because if anything, it requires you do to less, not more. All you have to remember is to use your mattress like a bed. Not like a gymnasium, not like a park bench and definitely not like a trampoline. Like a bed.